Last Saturday was Holi! 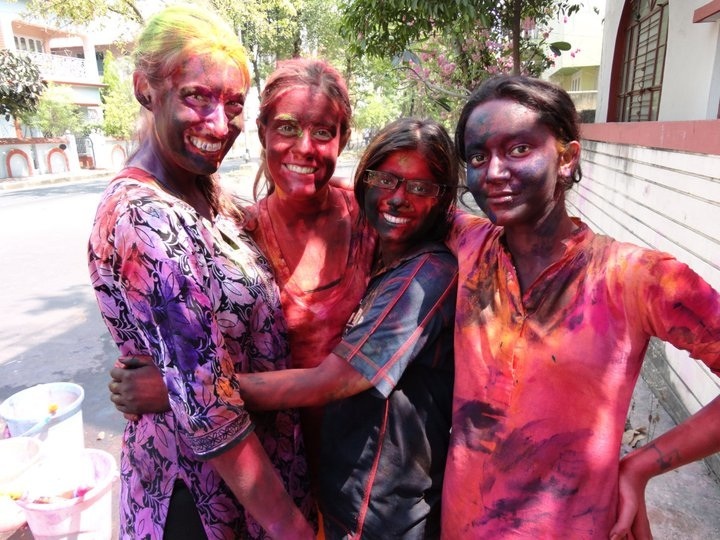 It’s the Hindu festival of colors that celebrates spring/summer. It also has some ties to Hindu mythology – apparently there are references to the god Krishna playing with all his girlfriends, or gopis, throwing colors at them. 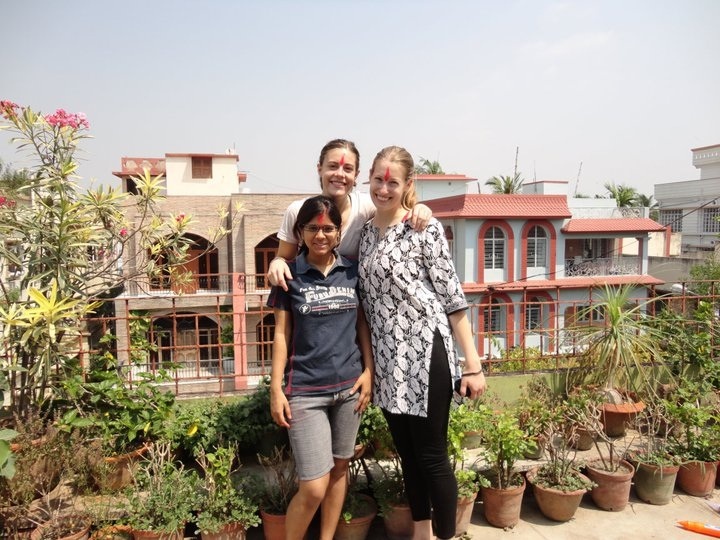 Elizabeth and I went to a friend’s house – Bhaswati – on Friday night since it’s not always safe to travel on the morning of Holi with all the people out in the street, especially as a foreign woman. 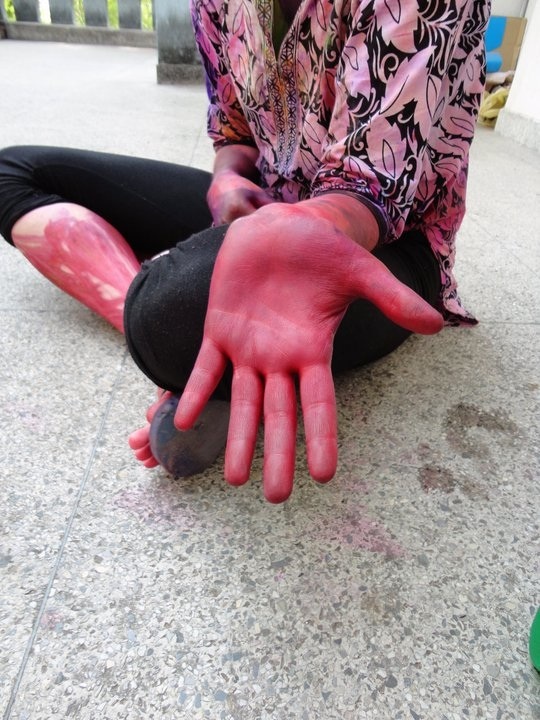 On Holi, many normal social restrictions are broken – you can come up to anyone on the street to shower them with the colors, touching their face, spraying passers-by with colored water, and many people take drugs on Holi. We didn’t want our host parents to worry about us, so we went on Friday night. Saturday morning was the celebration. Another friend, Raka, came over and we all went up to the terrace. First, Bhaswati did a small puja (ritual) by putting some of the red powdered color (gulal) on various idols and pictures of ancestors, as well as on her grandmother’s feet. 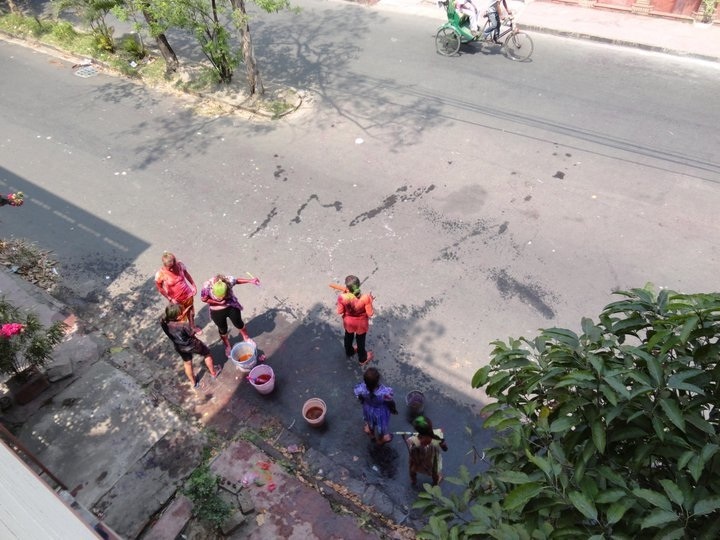 We all went up to the terrace to play then – throwing gulal at each other or another powder that when mixed with water turned into a clothes and skin staining paint! We moved down to the street to get some passers-by, and some neighbors joined us. It was so much fun – and I wish we had this holiday at home! The rest of this week hasn’t been too eventful. Classes are…still pretty lame and frustrating. It’s so hard that our educational systems are so different – here the students just take down the notes dictated to them and it’s so hard to deal with that when we come from a system where we are allowed to speak our minds and learn as much from our peers as we do our professors. At home, the professor is a facilitator of discussion – the students make the class into what they want it to be – whereas here, the teacher is the ultimate head of authority and knowledge. I am reallly looking forward to getting back to my CSB/SJU classes. We’re actually having a meeting with the administration tomorrow to go over some of our concerns. Though we knew it is the first program and very little was going to be sorted out before we arrived, we thought there would SOME more continuity than this. It’s just frustrating that it seems there is a serious lack of communication between the administration and the teachers and between our school and St. Xavier’s. For example, one of us went in to talk to one of the admins about something in her class, and he made a comment like, “oh, are you taking this course for credit?” The admins apparently don’t even know that we are here as real students who are taking courses for credit and will get grades that will be going back to our college at home as real grades. And it’s also hard that student expectations are not very clear – at home we get a syllabus that lays out your assignments, what you’re supposed to do, when it’s due, and what you can do to succeed in the class. Here, it seems like the teachers make up assignments on the spot in a kind of offhand comment, and we really don’t know if that’s serious or what they want us to actually do for the assignment or when it’s due. It’s just very frustrating. And at this point, it’s too late for there to be many changes for our group (since we only have another month of classes, in which I’m sure about half of them will be canceled) so we just hope this can be better sorted out for the next group. Yesterday, some of us went to the Park Hotel – a very fancy hotel here – since Kathryn’s family is visiting and are staying there. We went over to enjoy the pool and I was surprised to realize how much my standards/expectations have changed. This was a very nice hotel by American standards even, and I felt like I was not India. The bed was so soft and wonderful – such a contrast to my rather lumpy bed here at home. It was weird to be in a place so incredibly clean – not a spot of dirt anywhere. I never wear shorts and a tank top outside of my bedroom, and I felt practically naked going down to the pool in just shorts and a tank top. Small glimpses like this of the reverse culture shock I will experience when I go home makes me think I will have a hard time adjusting back to life in the US. I can’t believe it’s the end of March…I will be home May 9th, so I have about 6.5 more weeks left. I have less than 50 days til I’ll be home! WOW. I’m not entirely happy or entirely sad about this – I will be glad to be home finally, to get some stability and normal back to my life. 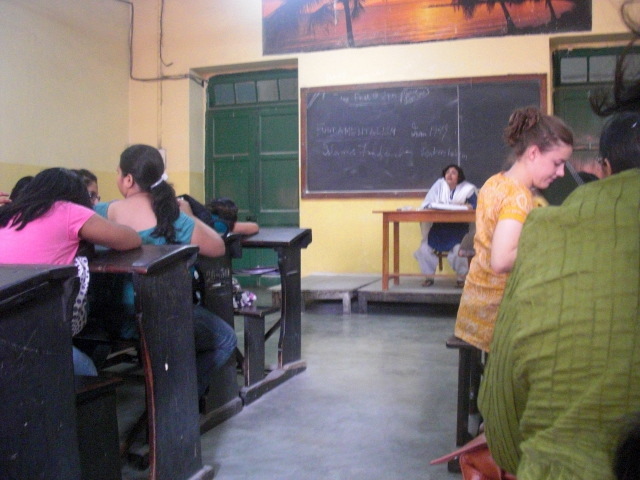 I’m not sure yet if India is a place I will visit again or if I’ll be “done” with it. I’m pretty sure I would like to visit again, but not for a long time. I would need a good break from India for a while, and to be honest I’m not entirely sure if I’ll make it back here since it’s so far away. I will definitely go back to France though – I love France for so many reasons, and I really do love India too (for completely different reasons) but it’s definitely more of a love/hate relationship here.